While thousands of people gathered around Miraflores Presidential Palace to greet the re-election of President Nicolás Maduro, opposition sectors, the United States, the European Union and the Latin American right launched a predictable destabilization plan against the most recent democratic electoral process undertaken on Sunday, May 20, in Venezuela. The Venezuelan people, victims of one of the most brutal economic wars of recent times, only comparable to the blockade imposed on Cuba for more than 50 years, re-elected Nicolás Maduro as their legitimate President with more than six million votes. Meanwhile, the “protectors of democracy” in the region and the world reactivated their hostile agenda against the homeland of Bolívar, and ignored the clear message emitted at the polls. The Venezuelan government, accustomed to this type of action since taking a different path to that dictated by Washington in 1998, once again faces a wave of interference in its internal affairs. The President of the United States, Donald Trump, announced on Sunday new unilateral sanctions against Venezuela, violating the principles of the Charter of the United Nations, and the norms of international law. Through an executive order, Trump prohibited any U.S. citizen, institution or company from purchasing debt or accounts receivable from the Venezuelan executive, including those derived from state-owned oil company Petróleos de Venezuela S.A. (PDVSA). Venezuelan authorities condemned the illicit and illegitimate measures which seek to expand the economic and financial siege against the country, undermine the right to self-determination of the Venezuelan people, and attack their model of socioeconomic development. According to a statement issued Monday, May 21, Canada and the thirteen Latin American governments that form the Lima Group, refused to recognize the election results. Among the arguments to support this aggressive stance is a supposed abstention of Venezuelans in the elections on Sunday. However, the presidents of both Chile and Colombia, members of the Group, were elected with a lower turnout than that which saw Nicolás Maduro re-elected, and yet they have not been subject to any such accusations. Likewise, the Lima Group includes nations such as Brazil, where a parliamentary coup removed the legitimately elected President Dilma Rousseff from power, and Luiz Inácio Lula Da Silva, the most popular candidate in the lead up to elections in the South American giant, has been unfairly imprisoned. Meanwhile, the President of Peru had to resign over accusations of corruption, and the 2017 elections in Honduras were marked by fraud and corruption scandals. The governments of Argentina, Brazil, Canada, Chile, Colombia, Costa Rica, Guatemala, Guyana, Honduras, Mexico, Panama, Paraguay, Peru and Saint Lucia, members of the Lima Group, agreed to “reduce” their level of diplomatic relations with Venezuela, and recalled their ambassadors to Caracas for consultations. The Group also announced that it will present a resolution during the 48th General Assembly of the Organization of American States (OAS) on the situation in Venezuela. In February, the OAS approved a resolution that demanded the Venezuelan government cancel the presidential elections. This organization has been at the forefront of the international attacks seeking to isolate those nations in the region undergoing progressive processes of change. Venezuela is the principal target of such attacks, due to its regional leadership in this regard. Thus, the OAS maintains an interventionist campaign against this nation while turning a blind eye to scandalous situations in other countries. Following instructions from the United States, several Latin American countries also stated that they will coordinate actions with international financial organizations to “try not to grant loans to the Government of Venezuela,” which is facing a major economic crisis. In addition, they noted that they will intensify and expand the exchange of financial information to perfect the sanctions against the South American nation, all with the objective of tightening the economic blockade against Caracas. One of the consequences of the economic war and crisis that Venezuela is suffering, promoted from abroad, is the increase in migration flows from that country to neighboring nations. Although this is a common phenomenon in the history of Latin America, and in the past Venezuela itself received millions of Colombians and other migrants, there are attempts to manipulate the issue in order to justify a conflict. Colombia and Brazil have both seen an increase in the presence of U.S. troops, while the U.S. government has said it hasn’t ruled out a “military option” in the case of Venezuela. Contrary to the attempts to maintain an independent foreign policy from the United States, the European Union has joined the attacks against the Venezuelan government. The bloc announced that it is studying the adoption of measures following alleged irregularities in the Venezuelan elections. According to the EU and specifically Spain, the elections in Venezuela revealed “fundamental democratic deficiencies” and “serious irregularities,” despite the fact that more than 150 international observers highlighted the validity and transparency of the results emanating from the polls. Before the official results were issued by the National Electoral Council (CNE), presidential candidate Henri Falcón had already stated that he wouldn’t recognize the results of the electoral process. Falcón, who obtained 1,820,552 votes, representing 21.01%, thus followed a formula widely used by the Venezuelan right on refusing to accept the results at the polls when unfavorable to them. Meanwhile, Javier Bertucci, the candidate for Esperanza para el Cambio (Hope for Change Party), who obtained only 10.82% of the vote, also joined the campaign to undermine the results, alleging “violations of the Venezuelan electoral law.” However, he later accepted the result, but continued to question the process. After being re-elected as Head of State, Maduro called for dialogue and reconciliation, proposals that were immediately rejected by the Democratic Unity Roundtable coalition (MUD) and other opposition forces. The MUD, which didn’t propose a candidate for these presidential elections, sacrificed its own political space in the country several months ago and embraced calls for violence, while crying fraud long before the results were announced, just like those opposition candidates participating, and also ruling out any possibility of talks with the Maduro government. Extremely discredited and divided, the MUD, which doesn’t propose its own government agenda, but rather a series of directives specified from abroad, is now trying to fabricate a scenario to delegitimize the elections in which it decided not to participate, aware of its likely defeat against Chavista forces. 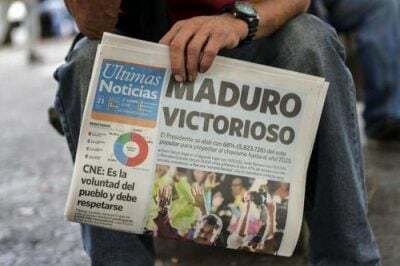 From the photos used in the international media, to the headlines chosen, the coverage of the elections in Venezuela was designed to try to undermine the participation of citizens and their majority support for the Bolivarian Revolution. Likewise, most of the Western mass media continues to echo terms such as “political prisoners,” when the government has provided countless evidence that those who are being prosecuted have committed crimes or incited violence, which has resulted in hundreds of deaths.